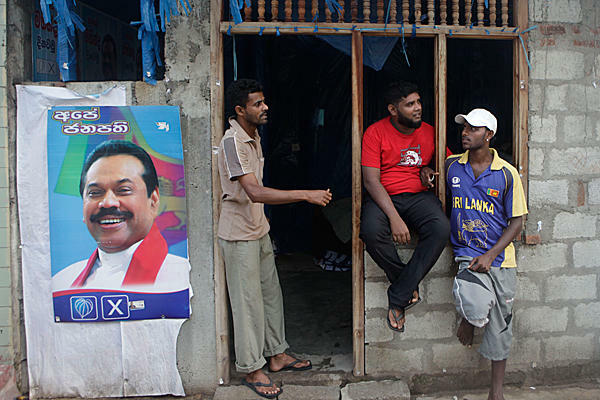 Rajapaksa has a wide lead in the number of seats won. However, he is not likely to get the two-thirds majority needed to change the constitution unilaterally. Voter turnout hits record lows, down to 50 per cent in some places. Catholic and Buddhist religious leaders appeal for harmony and cooperation in the interest of the country. Colombo (AsiaNews) – President Mahinda Rajapaksa’s party is slated to win a majority of seats in the elections to renew the 225-member parliament. Counting is underway, but it has been slower than expected because of alleged vote rigging in two districts. However, it is not yet clear whether the United People Freedom Alliance (UPFA) will be able to win the two thirds of the seats needed to amend the constitution without the participation of the opposition. The turnout was also very low (45-50 per cent). The vote went off without a hitch in most of the country. In some places, local election commissions were quickly alerted to abuses, including violations of campaigning rules. In Nawalapitiya, the vote count had to be repeated. The ruling party is in the lead in most districts; the opposition Tamil National Alliance is ahead in Vanni and Batticaloa. Transport Minister and UPFA spokesman Dullas Alahaperuma said the ruling coalition might get 136 seats out of 225, but was not certain whether it could get the two-thirds majority Rajapaksa was hoping for. The most significant result so far has been the low turnout. About half of the population stayed away, showing its estrangement from parties, candidates and electoral system. A Sinhalese Catholic leader, who asked for anonymity, told AsiaNews that the system’s obvious weaknesses must be corrected. However, he added that we must wait “for final results” and respect the will of the voters. Fr Victor Soosai, vicar general of the diocese of Mannar, said the vote was peaceful, acknowledging the low voter turnout. He also mentioned the problems that still burden Tamils, victims of the civil war between military and Tamil Tiger rebels (LTTE) that lasted three decades. Mgr Winton Fernando, bishop of Badulla, said, “The results are an expression of the will of the people,” and appealed to everyone to accept them as “a mature people”. In his comments, Mgr Malcolm Ranjith, archbishop of Colombo, urged the winners “to extend a hand of friendship to the losers”. He also invited the latter, in a spirit of magnanimity, to accept their defeat and work with the winners to “make Sri lanka a better place”.